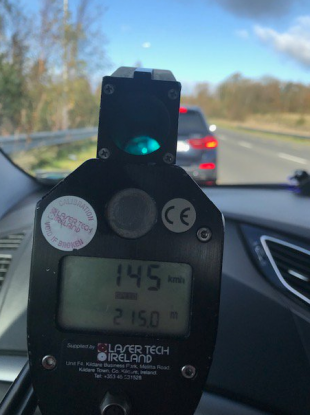 A garda speed detector reading 145 km/h. A DRIVER WAS arrested on suspicion of drunk driving after they were clocked driving at 145 km/h in Roscommon yesterday morning. The arrest was one of a number of enforcement actions taken by gardaí over the course of the bank holiday weekend. Gardaí say they stopped the car after it was seen speeding on the M6 motorway near Rathpeak at about 10am yesterday morning. The driver was subsequently arrested on suspicion of drunk driving. An enforcement operation in the Kildare area also detected a number of other vehicles speeding, including one driving at 86 km/h in a 50km/h zone in Prosperous village. In Kerry, a driver was stopped for careless driving in Killarney on Saturday night before later testing positive for cocaine. The new drink driving legislation championed by Transport Minister Shane Ross took effect from 26 October, meaning that any driver found to be above the blood alcohol limit will receive a driving ban. The limit is 50mg of alcohol per 100ml of blood. Email “Driver arrested on suspicion of drunk driving after being clocked at 145 km/h”. Feedback on “Driver arrested on suspicion of drunk driving after being clocked at 145 km/h”.